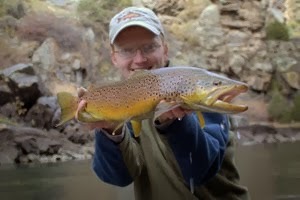 Winter fishing for brown trout is one of my favorite ways to spend time on the water. Not that I'll turn down fishing at other times, but having a stream to yourself is well worth the numb hands and frosted ears and nose that usually accompanies fly fishing this time of year. Not long ago, I managed to get out for a day on the water with my then girlfriend Leah (now fiancee!!! so more on that in another post!) and a couple of our friends. The day was cool with clouds, but not as cold as what we are experiencing now. 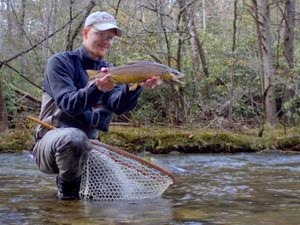 The fish of the Smokies were still just active enough that we had a chance. In fact, Leah started the day off in a hurry, catching a nice rainbow and a beautiful brown in short order. 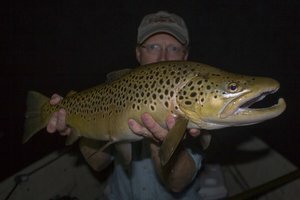 I was a little slower getting going, and thought I had messed up my day when I missed a really nice brown trout on a streamer several casts in a row. This was one hungry fish! Unfortunately, I could not connect, and so we went looking for other fish. About this time, our friends Jayson and Hailey showed up. We all went into this day knowing that the fishing would be good but the catching might be slow to nonexistent. Instead, we were just glad to get out and enjoy some time in nature with friends. Imagine my surprise when we found a really nice fish sitting out at our next stop. Actually, to be more accurate, I saw the fish and spent the next few minutes trying to decide whether it was worth a cast or not. 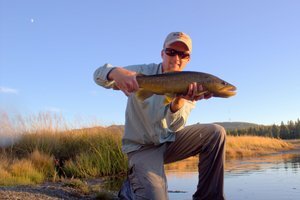 Most of the time with large brown trout, it is a waste of time if they are just sitting down and not moving. That's not to say one won't bite under those circumstances, but they tend to be a little finicky to begin with. A fish that's not moving is not a feeding fish. This fish was moving side to side just enough that I figured there was a chance. After asking everyone else if they would mind, I ran and grabbed a rod and slipped down to the water. Moving slowly into position, I had the advantage of a large boulder to sneak up behind. This allowed me to get within casting range without spooking the fish. After a handful of casts, the nice fish sat down, and I realized that, despite my careful presentation, somehow I had spooked the fish. Suddenly, I saw a shadow and realized that another fish was moving nearby. I was shocked to realize there was more than one big trout in this spot, but quickly made the cast. My leader ticked ever so slightly, and I set the hook hard. The big brown trout came to the surface and rolled. Meanwhile, my buddy Jayson slid down the steep bank from where everyone had been watching and quickly grabbed my net to help. Amazingly, the 10' 3 weight TFO BVK rod I was fishing handled the fish in short order. The rod had a soft enough tip that I could really put a lot of pressure on the big trout without risking breaking my tippet. Yet, there was enough backbone deep towards the handle that it could turn the fish. Soon Jayson swooped in, and I was looking at one of the larger fish I've caught in the Smokies this year. I'm not sure who was more surprised about me actually hooking and landing the fish. 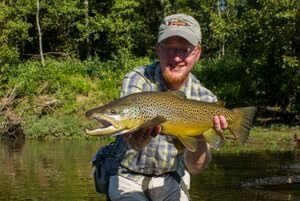 It isn't often that everything comes together just right when sight fishing one of these big brown trout. I was thankful to have pulled it off when I had friends around to help with pictures. Leah grabbed my good camera and started shooting away. I think she has natural talent with the camera because they turned out great! Over the next 3-4 months, there will be more opportunities to sight fish to large brown trout. The cold water of winter is a lot clearer than the warm waters of summer. Cold water doesn't hold suspended solids as well, so even after a big rain it will clear quickly this time of year. Spend plenty of time walking the banks and looking for big trout. I find it helps to leave the rod in the car until a fish is located, otherwise you'll find yourself fishing just because. Once you find one, keep going back until you catch it out feeding. With enough time and effort, these big wild brown trout of the Smokies are catchable. I'll be out there again through the cold months, but not as much as usual. I have a lot going on to keep me busy between work, school, and an upcoming wedding. Stay tuned for more on all of those! In the meantime, thanks for stopping by and letting me share with you.